For me personally, one of the most creative and fun aspects of costuming involves accessorizing. For many costumes, the most important accessory is the weaponry. Whether you’re going to a fandom convention as Cloud from Final Fantasy, or Jack Sparrow from Pirates of the Caribbean, the weapon can make or break the costume. However, more and more conventions seem to be cracking down on rules concerning weapons, even if they are simply made from foam and cardboard. These days if you bring a weapon into a convention’s facility, you will probably end up having a nice chat with security. Most conventions actually have weapon policies in place – even if the weapons in question are completely fake and/or harmless. Now, I’ve never heard of anyone getting sliced in half by a swordsman at a convention, but the rules are the rules, and when you buy your ticket to a convention, you’re agreeing to uphold them. In order to help you better prepare for your costume, I’ve actually visited the websites of conventions big and small and compiled a list of common weapon policy statements. I’ve also posted some of the stricter policy statements out there. This is so you can get a general idea of what is commonly acceptable, and what is not. However, don’t assume anything about a convention’s weapon policy. If you are attending an upcoming convention, you are highly advised to ask for their specific weapon policy, as some of their rules may differ. If a convention doesn’t have a clearly stated policy on their website, find a way to ask in advance. You don’t want to have your wonderfully hand sculpted Final Fantasy sword confiscated by the venue’s security, or worse, the police. And just because a weapon clearly looks “fake” or “too fantastical” to be real in your eyes, security may not feel the same way. Given the statements above, you can see that there is a pretty wide spectrum of rules and regulations, everything from “just don’t annoy anyone” to “absolutely no steel or guns.” The key is to do your homework, and find out the policy before you start making your prop, or selecting your costume’s accessories. You may even want to prepare a few different variations of the same weapon (fake vs real steel) if you intend to wear the costume to different conventions. Even if a convention does permit certain weapons, they usually require them to be sheathed, or peace bonded. Peace-bonding is the act of making it clear that your weapon cannot be used (either by a brightly colored tie, or trigger lock) and that your intentions are peaceful. Some conventions may actually offer a peace-bonding booth, or otherwise have assistance available for those who need it. Again, you need to check with each convention specifically. But if you know a con requires peace-bonding, I recommend arriving with the weapon already bonded. Better safe than confiscated. 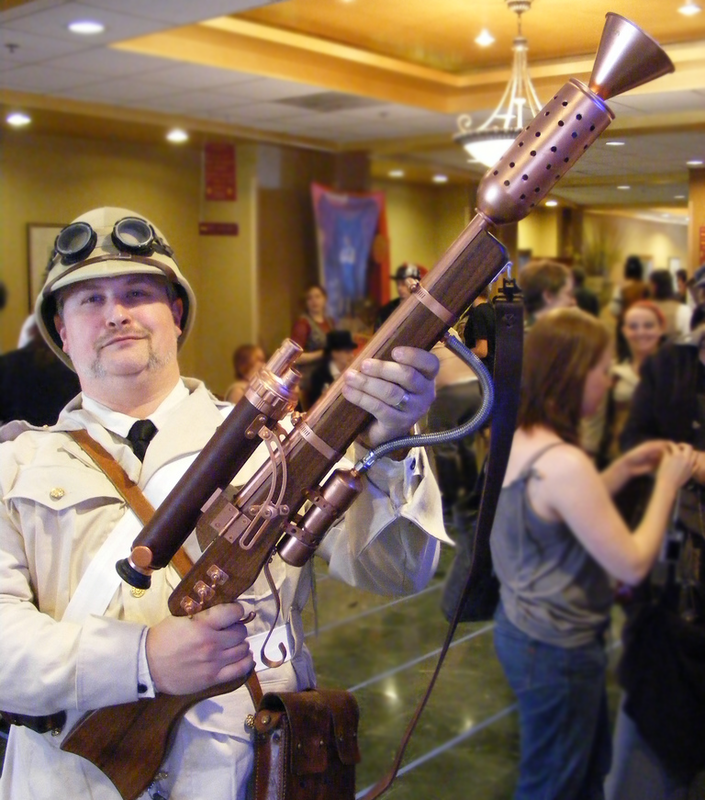 There is no doubt that certain costumes involve iconic weapons, and that the cosplay isn’t quite complete without them. However, when there are thousands of people in a shared space, considerations must be made. Are some conventions’ policies too lenient? Too strict? Can there be a happy medium? Where do you stand on the issue? A lot of Convention policies are vented by lawyers and local police is something that is forgotten in the conversations. I know Otakon (the largest anime con on the east coast) has a strict policy because that is what local law says on these matters. Most of the large ones have to deal with lawyers and law enforcement on this issue. There are many venues that are not familiar with fandom events, and I think they tend to panic at the thought of people walking around with weapons (whether real or fake) and terrorizing the locals. I do understand their point of view. No one wants the police called out to their property because someone thought a fake weapon was real. Even worse, none of us wants someone to actually get hurt because someone got over-enthusiastic with their prop. At the same time, though, perhaps some further education of venues about fandom events is in order, so they better understand that props are an integral part of the event, and not necessarily a cause for worry. I gotta say, that’s one heck of a gun. (That’s a compliment, not sarcasm.) I’d be afraid to take it away from the owner, if for no other reason than fear of being Transmogrified into something terribly froglike. In all seriousness, this is a nice reminder for folks out there who might otherwise assume, innocently or otherwise, that going to a convention means they can automatically do things that would get them questioned or worse in civilian life. When we were writing the rules for Mind’s Eye Theatre, one of the most basic rules covered weapon props. Whenever a group complained that it cramped their style, we just reminded them that while they’re welcome to do what they like in the privacy of their own homes, encouraging people to carry fake guns and knives is just foolish in this very security-conscious day and age.